Give yourself the gift of hands-on healing. Our massages are designed to take you on a journey of discovery, peace and harmony. Our skilled therapists provide a complete range of treatments that address mental and physical well being. Taking care of your body should be at the top of your priorities. By adding therapeutic massage to your current wellness routine, you’ll feel, look and simply be healthier far into the future. In fact, stress relief alone can improve your vitality and state of mind. So what better way to prep for a long, happy life than a relaxing, therapeutic massage at Unwind at Westclox. Couples Massage: Enjoy a massage with a friend or romantic partner on side-by-side massage tables set within our pink crystal Himalayan salt room. Two therapists work in unison to provide an unforgettable shared experience. Available in 60 or 90-minute sessions. Unwind Signature Massage: Featuring five different styles of long, fluid strokes, Swedish Massage (also known as Classic Massage) has proven effects in reducing pain, improving circulation and reducing joint stiffness. Treatments are available in 60 and 90-minute sessions. Deep Tissue/Orthopedic Massage: Designed to relieve severe tension in muscle and connective fascia, this massage is an intensive, precise treatment to help release chronic tension & knots. Available in 60 or 90-minute sessions. Medical Massage: This massage is a system of manually applied techniques that can achieve the following: relieving and reducing pain, establishing normal tissue tension in sensitive areas, creating a positive tissue environment, normalizing the movement of the musculoskeletal system. Tailored massage techniques are customized for individuals with extensive medical histories such as: multiple surgeries, chronic conditions, cancer survivors and many more. Available in 60 or 90-minute sessions. Sports Massage: This specialized service recognizes that when muscles are shortened by activity or overuse, serious complications or other conditions arise. A series of techniques are used to aid in muscle recovery, improve flexibility and endurance; reduce fatigue and help prevent injury. Available in 60 or 90-minute sessions. Reflexology: Ancient technique that involves a precise and systematic foot or hand massage, designed to stimulate reflex points that corresponds to the organs, systems, and structures of the body. Enhanced by an invigorating foot scrub, it will ease tired feet, relieve stress, restore and maintain the body’s natural equilibrium and encourage healing. Available in 60 minute sessions. Cranial Sacral: Cranial Sacral Therapy is a light-touch approach to healing. This hands-on session releases tensions in the soft tissues and fluid of the craniosacral system that protect the brain and spinal cord. It offers effective relief for headaches, TMJD (the temporomandibular joint on either side of your head, where your skull and lower jawbone meet) back and neck pain. Available in 60 minute sessions. Lymphatic Drainage: Lymphatic drainage works by circulating body fluids, stimulating the immune system, and promoting a relaxed, balanced autonomic nervous system. It offers positive results by reducing the swelling and lymph edemas of many origins; detoxifying the body; relieving chronic fatigue syndrome, chronic pain/inflammation as well as fibromyalgia; and much more. Available in 60 or 90-minute sessions. Prenatal Massage: Nurturing for the mother-to-be, with the use of specialized positioning, this massage insures the ultimate in comfort and relaxation. This 60 minute session is customized with support cushions to relieve muscle aches, eases joint pain and reduces swelling. Available in 60 or 90-minute sessions. Oncology Massage: Oncology massage modifies massage techniques to safely work with the complications of cancer and cancer treatment. It helps to reduce pain, fatigue and nausea. Available in 60 minute sessions. Trigger Point Therapy: Applies direct pressure to specified points on tender muscle tissue to bring about reduction in muscle tension and pain relief. It is very useful in the relief of: back/neck/shoulder pain, sciatica, headaches, muscle and joint pain. Available in 60 minute sessions. For prices and availability, please visit our online booking system. When the body is tense and under stress, it produces unhealthy levels of the well-known stress hormone, cortisol, which can contribute to weight gain, sleeplessness, digestive problems, and headaches. Massage therapy has been shown to decrease cortisol levels in the body. This enables the body to enter a recovery mode. 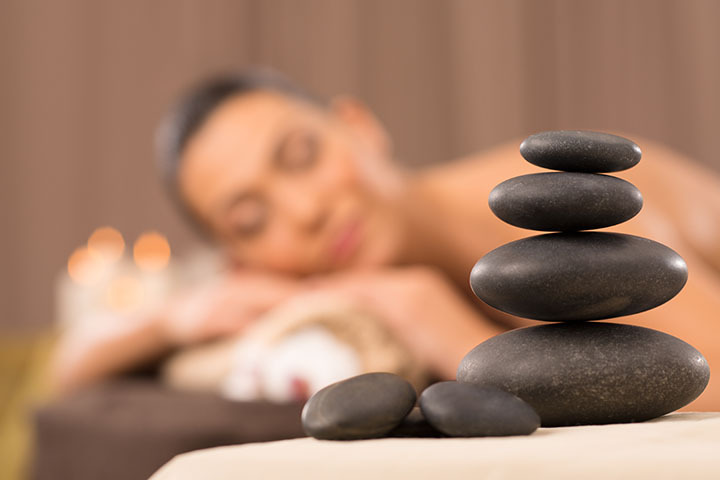 Moreover, this form of therapy also triggers lasting feelings of relaxation, improved mood, and reduced stress levels. Regular massage therapy sessions have been found to reduce blood pressure levels. In fact, some long-term studies have shown that a consistent massage program can reduce both systolic (upper number) and diastolic (lower number) blood pressure. Moreover, it can also reduce cortisol levels within the body. Furthermore, consistent massage sessions can also reduce trigger sources for anxiety, hostility, tension, and depression. In turn, lower blood pressure levels can also reduce the risk of heart attack, stroke, and/or kidney failure, as well as many other health issues. The purpose of massage therapy is to target the source of the body’s pain via eliminating tense muscles, increasing flexibility, and providing relaxation to the affected muscles as well as the body as a whole. Massage also promotes circulation to the affected or injured muscles, which increases nutrients and oxygen to the damaged tissues. In turn, this increased activity to the affected sites reduces stiffness and edema (swelling) in the muscles and joints, as well as increases flexibility to help reduce pain. Moreover, this form of therapy also releases endorphins (pain-killing hormones), which boost the dopamine and serotonin levels in the body. These hormones assist the body in many ways–physically as well as emotionally. Case in point, they promote healing, pain management, and feelings of euphoria, as well as help to calm the nerves. Many Americans experience back, neck, and muscle pain from a variety of sources. However, the primary cause of this pain results from poor posture. In fact, chronic back pain, which is the number one reason for missed work days and second most common cause of disability, is often the result of incorrect or poor posture while standing and/or sitting. Moreover, being overweight, poor posture, and repetitive or overuse movements can also contribute to the strain on the back and other potential problem areas. As a result, the added strain often causes spasms, pain, and tense muscles in the hips, glutes, back, neck, and legs.